Home/Is Your Home Concrete Built? The More Concrete Elements in Your Home the Better! Concrete as a building material is truly is the structural material of choice when building or buying a new home. The concrete house construction of concrete homes are known for their durability and longevity. They are built to last and concrete’s flexibility and adaptability means that concrete homes built with concrete can easily be reconverted and internal layout can be easily changed to accommodate any design. Concrete is non-combustible and inherently fire proof, retains its structural integrity in a flood and does not warp, rust or rot. Concrete’s thermal mass reduces energy consumption and moderates internal temperatures thereby increasing your home’s energy efficiency and reducing energy bills while also creating a more comfortable living environment. 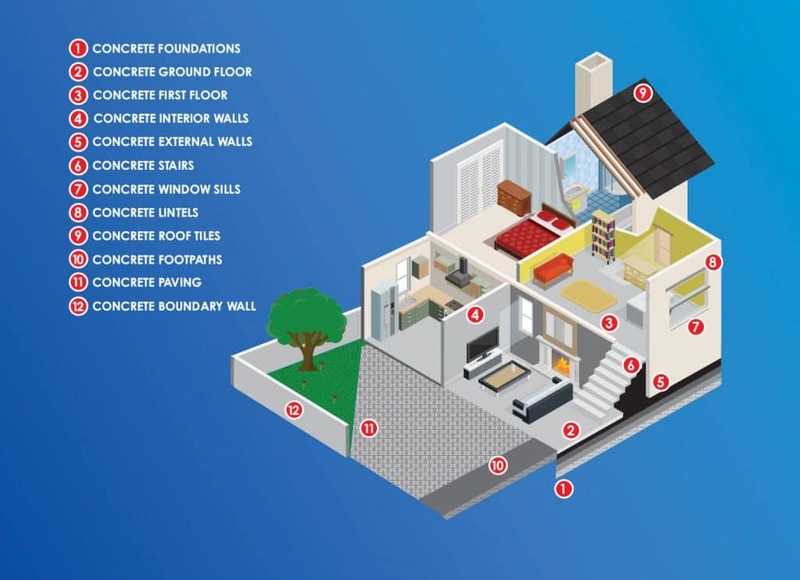 Houses built with concrete blocks offer excellent acoustic performance, reducing noise levels both within your home and between concrete homes in higher density developments. Concrete is both functional and aesthetic and can be used to build homes that are practical or grand designs which are complex and elegant. Finally concrete and concrete products are all manufactured locally, thereby creating local jobs and supporting local communities.